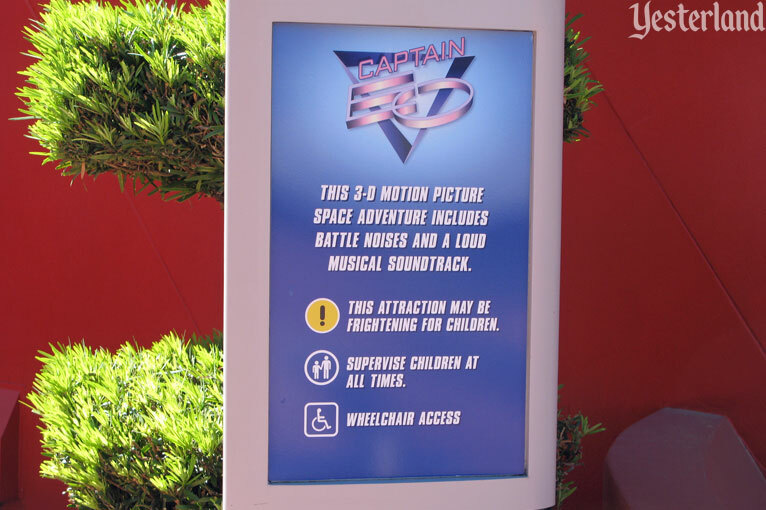 If Captain EO was still playing I would think they would be pulling it. Fast! As some would have you believe, "It was all started by an anti-Semitic." No need to shut it all down. There are some who say that AK also incorporates many things that you find in a zoo (and again, we are not lacking for zoo experiences). To me, the difference is that AK excels at it's attempts at being a zoo. The keepers know their animals really really well and are always around to answer questions - better than most local zoos; the exhibits are well adapted for their animals and beautiful; and the activities border on things found in a science museum. So to me, EPCOT either needed to up it's game and hope that they were able to engage their visitors (which seemed unlikely - the lines for Sum of All Thrills were rarely as long as the quality of the experience would support) or move on. I wish they could make the Living Seas more enchanting. I'm glad that Living with the Land and SSE cont to exist. And Mission Space is good for what it is. (again - the exit activities seem to be underutilized and I wonder if they are interesting but we always keep moving). I have no idea what you are talking about?? I would hope not. Can't believe everything you see because it is on a documentary. Especially when evidence goes against their claims and not with them. If this is the case if someone wants to oust Iger they can just make a documentary about him too. Yeah, MJ is innocent lol. they are pretty much omniscient. Sure its changed... especially since you havent been back for ... gasp... 26 years... You cant expect to return and experience what was there long ago. Disney has surely lost its way when it comes to EP because theres never really been a cohesive plan/ vision in mind regarding a path it would follow. They keep throwing things into the mix and hope it does the trick. Despite the issues its had and the empty areas it holds, I still enjoy the park and all it has to offer. I expect them to continue having events and festivals to keep it going which draws the crowds. They will implement patchwork attractions but never go back to what it was originally meant to be. We call it DFFA (Disney's Food Festival Adventure). Just throwing this out there, but wasn't Epcot more or less meant to be an ever-changing park if anything? I realize things are changing in the park. I did not like them taking Maelstrom out. They could have kept it in there and still had Frozen. The good part is at least there are still some aspects of the ride that remind you of Maelstrom. One thing I missed was how sparse Innoventions was. There used to be two sides of it, now just one and even then it is not plentiful. Is it the Disneyfication of Epcot? Some might say. Not all change is bad. Not all change is good, either. Most of the changes to Epcot in the past 20 years have been very, very bad. In my opinion, replacing the Kitchen Kabaret/Food Rocks theater with Soarin' was a good change. Journey Into Imagination's changes? Mission Space replacing Horizons? Quite possibly the most egregious changes to rides in the history of theme parks. Innoventions used to have a bunch of sponsored exhibits. I'm not sure if companies have declined to have space in Innoventions or if Disney's been quietly ending sponsorships in anticipation of the radical change to the space. Hi guys! Sorry for the typos. I meant obviously by that one weird spelling. I also do not remember the old Mexico ride so sorry about that. Not to sound like a broken record, but what would Walt think? Honestly. Because we do have evidence of what he dreamed of Epcot to be. The problem is, it is the first of its kind, and still is, and there just isn't any precedent for it. What should it be? More educational and adult-like? Or should it have more of the cartoonish influence on it? I honestly think they shouldn't dumb it down anymore. I wasn't keen on it back as a teen, but I was comparing it to the Magic Kingdom. It is quite okay that it is completely different than the MK. Here is the kicker, my 7 year old son LOVED Epcot last year. We literally did every attraction and I thought he might get a little more bored, but he didn't. So who knows. I just think that they need to keep the World Showcase the way it is. They do a wonderful job of keeping each country as its own country/culture. Walk around Morocco and it sort of FEELS like you are there. A ride doesn't need to be in every country. Or a show. Sometimes it is just simplicity that rules the day and just soaking up the culture of that country for a moment. This is just something that can't be done at a Six Flags park and there is nothing wrong with that. I love Epcot Center. Always did. always will. Epcot never was what walt imagined. Even in 83. Walts dream would have failed btw. It would have been amazing for humanity, but never would have made money. And with all of the corporate raiders that were ready to take over. Disney as you know it would prob be a distant memory. ...and it wasn’t pretty lol. Personally, I just go to Epcot to smell the nostalgia. Epcot never was what walt imagined. Even in 83. Walts dream would have failed btw. It would have been amazing for humanity, but never would have made money. Good to see someone actually agrees with me that Walt’s Epcot would have failed. Not tying to be negative, but his city could not have existed the way he envisioned it. You can’t create an utopia in the real world. The real world consists of real world demands, which are very different from a theme park. I'm not sure it would have been amazing as it doesn't deal with institutional inertia imposed by Governments and the people who vote for them. Celebration was Disney's foray into that space and they learned very quickly that without the structuring of local governance they were able to achieve with Reedy Creek Improvement District ("towns" of Bay Lake and Lake Buena Vista population 44), people who vote change their carefully crafted vision into something else entirely. It's hard to tell what Walt would have thought since EPCOT Ctr. is not what Walt was trying to created. People really need to get that fact firmly imprinted in brain. EPCOT Ctr. was a theme park, Walt's vision was an actual city. He would be highly annoyed, but, not because of it's contents, but, because it is NOTHING, at all, what he was trying to do. He probably would have been OK, at least, with the original as long as his city was built, without it they all would have been sent on their way. I was just thinking that "Celebration" outside of Orlando might be the closest thing to an original concept of Epcot, minus the futuristic things. Who really knows how much Walt would have tweaked things too. He said Disneyland will never be finished so I am guessing Epcot would never have been finished either.